If you’ve recently started a new business, focusing on SEO is paramount. Improving your website’s SEO will help your business rank well in the search engines, reach new customers and drive traffic to your site. But SEO is complex and involves implementing a variety of tools and strategies. So where should you start? There are a number of WordPress SEO plugins, but Yoast is by far the most advanced. This free plugin will help optimize your content, tell you what you need to improve, help you add metadata, create a sitemap for your website, and much more. Google monitors site’s speed closely, so it is crucial that you focus on ensuring your pages and posts load quickly. You can check your site’s speed times on Pingdom, where you will receive a summary of how your site is performing and how to improve it. For other tips to help decrease up your site’s loading times, check out our article ‘How to Make Your WordPress website Load Faster’. Google has recently started to penalize sites where content is not easily accessible on mobile devices. To learn how mobile friendly your website’s pages are, use Google’s Mobile-Friendly tool. Test how easy your content is to view on a mobile and learn what needs improving on your site. If you are using an old unresponsive theme, it may be time to update it. It is important to know how well optimized your website is. SEO SiteCheckUp offers a free and in-depth tool enabling you to analyze what still needs improving on your WordPress website. The results are broken down into the categories of General SEO, Speed, Server and Security, Mobile Usability, and Advanced SEO, giving you actionable tasks to help you make the necessary changes needed. Whatever your business, adding a blog to your website is a must. Posting interesting and relevant articles regularly to your blog will appeal to your audience and encourage them to return. It will also encourage a steady stream of new visitors, drawn to your site to read specific posts. The regular updating of your site, and the increase in traffic, will help to improve your site’s rankings in the search engines. Creating a content strategy for your business is vital, so each article you publish has a purpose. And do your keyword research, so every article you write includes terms that your audience is already searching for in Google. Writing an assortment of evergreen articles is important as this is content that is ‘ageless’ and will still be searched for and useful for years to come. Always make sure your content is original and top quality, so your visitors will stay and read an article and not just bounce within seconds of arriving on your site. Also consider writing a number of ‘how to’ articles that help people solve problems. This type of post generates high levels of traffic, and the more traffic your site receives the higher your pages will climb in the search engines. Positive metrics like low bounce rates, time spent on site, and pages viewed all help with SEO. Once visitors have arrived on your site to read an article you want them to stay, so make the navigation of your site easy. An effective way to do this to use a popular posts plugin. Bibblio is an impressive SaaS product that has recently launched a WordPress plugin. This solution will enable you to add stylish popular posts sections to your blog. By displaying relevant content to that already being viewed, your visitors are more likely to click through to continue their reading, increasing page views and time spent on your site. Adding an engaging comments section is an effective way to create a community of regular visitors. Google wants to see your site is interesting to your audience and being used, so having returning visitors will impact on your SEO. 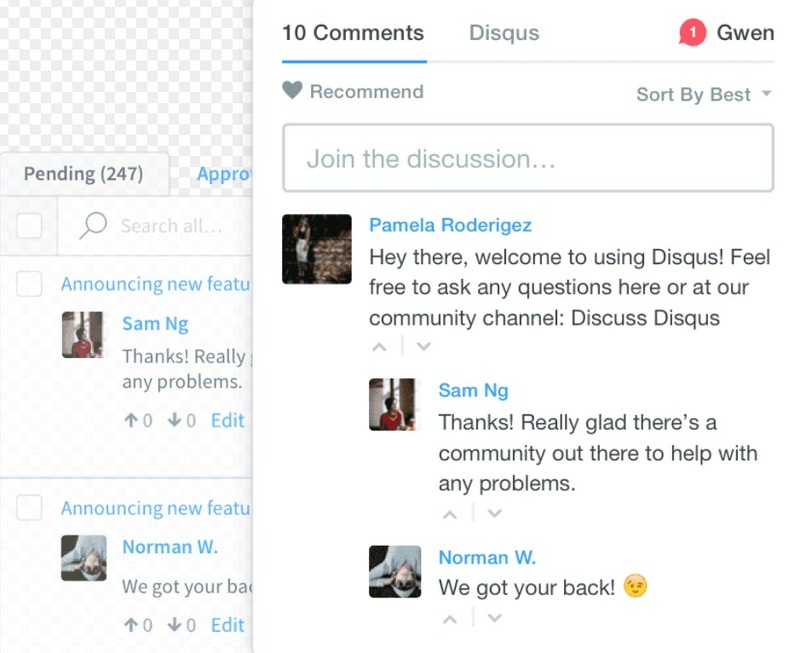 Use Disqus, a third party solution that will add a dynamic and interactive comments section underneath each of your blog posts. Let readers add images and videos to discussions, vote, recommend, create their own threads and much more. Becoming engaged in interesting threads will encourage visitors repeatedly visit your site, helping to improve your SEO data. Backlinks are important, but not easy to achieve. Backlinks are links to your site from other websites. These links help the search engines find your site and index your content. To get started creating backlinks, begin by commenting on blog discussions and forums. The more ‘high profile’ the sites the better, so concentrate on linking to large popular websites that are big names in their niche. Guest blogging is another great way to receive backlinks. Contact site’s that are relevant to yours and ask if you can publish an article on their site. Although you don’t get paid for this, you will be able to add your bio underneath with a link back to your site. Guest posting will also enable you to reach a new potential audience, helping to drive traffic to your site. There is no direct evidence that the sharing of content on social media is taken into account by the search engine algorithms. However, the larger your social media following and the more your content is shared on the social platforms, the more traffic your website will receive. Not only are high levels of traffic good for your business, Google also monitors traffic levels and will reward your site accordingly. Try adding Monarch social media share buttons from Elegant Themes to your WordPress website to encourage your visitors to share your content on their social media platforms. Use a tool like Buffer to set up automatic posting to your social media channels. And add beautiful social media feeds to your website, using the free WordPress plugin Feed Them Social, to promote your channels and inspire people to follow you. Local SEO is a big deal and if your business wants to rank in local searches there is much you can do. Yoast has developed two premium WordPress plugins, Local SEO and Local SEO for WooCommerce. Both these plugins will enable your site and business to get better search results in local searches, as well as enhance your contact pages with Google Maps. opening times, store locators, and more. It is also important to join up with Google My Business. By creating your own free listing with Google My Business, your business will appear on Google Search and Google Maps. This will help customers quickly and easily find your website and get in contact. As you can see, there are many SEO top tips that you can implement. By dedicating time and effort to SEO, and incorporating the tools and strategies mentioned in this article, you should soon see positive results. And as your site rises in the search engines, the increase in traffic to your website will help your business grow. Good Luck! For sharing such valuable information with us. I like your topic; especially it will help to them who are planning to create a new business online. Here, your provided information help them to boost up relevancy on google search engine. I would like to share my quick knowledge with you guys. Hope these tips help you. Well, I’ll give you 10 Simple Tips. 1.Use Keywords in your Title, URL, Meta-Description. 2.Don’t stuff keywords because it will lead to negative SEO. 3.Optimize the size of your Images used in Website for Better Page load speed. 5.Sprinkle your keywords in content. 6.Use fresh content, don’t copy paste content from others. 7.Insert Sitemaps and Include Robots.txt file in your website. 8.Add videos or add a link to your videos for decreasing bounce rate of your website. 9.Use Infographics to attract users. 10.Focus on internal and external linking. All above mentioned SEO tips really helpful for every blogger…thanks for this Post…..! !